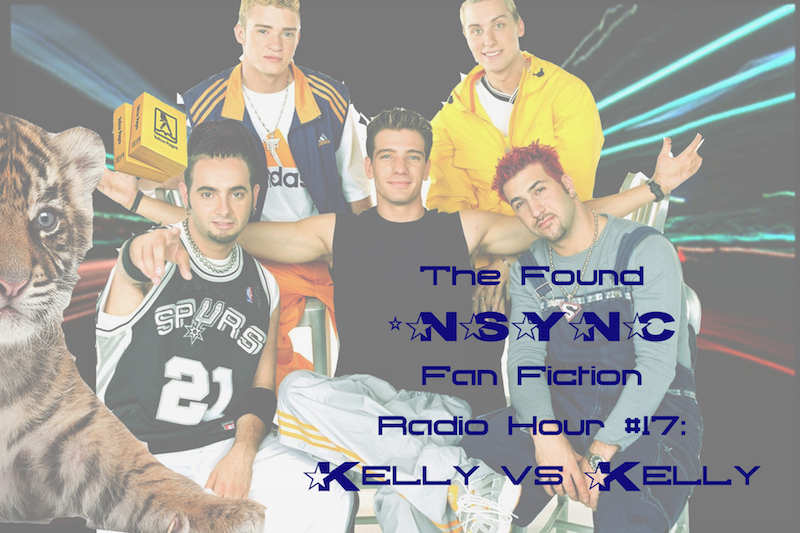 The Found *NSYNC Fan Fiction Radio Hour We read aloud pages of one author’s *NSYNC fan fiction, from a binder found at a thrift store. With piano accompaniment! In The Found *NSYNC Fan Fiction Radio Hour, we chronologically read aloud pages of an anonymous author's *NSYNC fan fiction, from a binder found at a thrift store. In this episode, it’s a showdown between Joe Fatone’s pregnant fiancé Kelly and his ex-girlfriend (also named Kelly). Threats are made, the narrator makes realizations about closure, and Sarah Michelle Geller makes an appearance! We drink 7-11 hazelnut coffee and continue theories about authorship of the binder. And! We realize that the Hava Nagila is basically the Can-can. Also in this episode: lighting up loved ones near and far with Tiny Prints junk mail, the Yellow Pages, pop vs soda, Grace Zabriskie, the keyboard string patch setting that makes everything sound like the X-Files, Baby Tiger Cuddle Time, threatening to to tell a story about the Goo Goo Dolls, a Phillip Glass *NSYNC crossover and more! Find us on iTunes/Apple Music Podcasts here. Copyright 2017 Liz Mason. All rights reserved.